Pam at Digging has invited bloggers to post and write about their favorite national parks as a sort of tribute to the great PBS series on national parks by Ken Burns. Pam is collecting links to the posts and they can be found here. Pam's got some great posts as do others. I asked Pam if it was okay to post about a non-United States national park since I haven't been to a U.S. one since I went digital (and my scanner isn't working at the moment). She encouraged me to go ahead so this is my tribute to national parks. 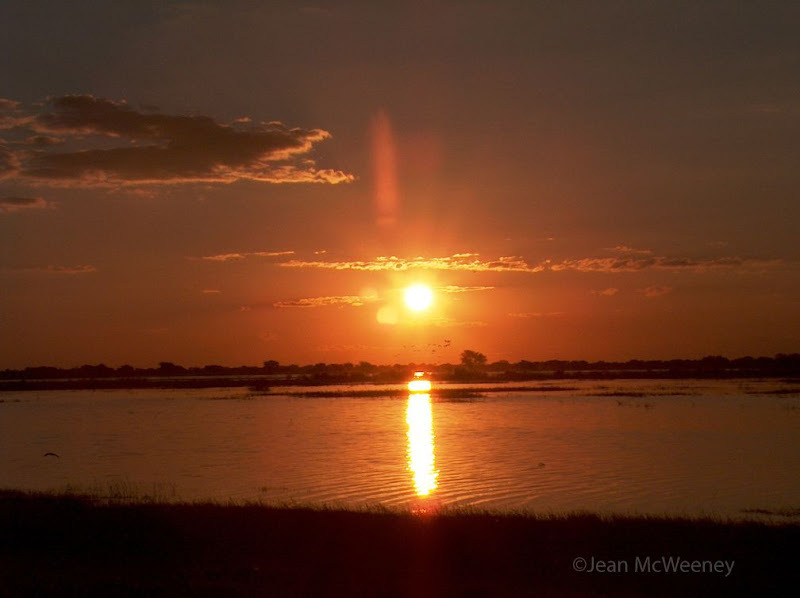 The photo above is from Chobe National Park in Botswana. I was very fortunate to be able to go there 5 years ago. I had always wanted to go to Africa, ever since I began reading Jane Goodall's articles in National Geographic back in the sixties. Eventually my interest led me to study baboon behavior at a research institute in the U.S. but one thing led to another and all of a sudden I found myself in the software industry. And I stayed there for decades. But I never lost my dream of seeing those animals in the wild and so when I was finally able to do so, I went. I could of course, show you zillions of photos of the animals we saw but I think that would be too much. Besides, it wouldn't tell you that much about this lovely park. 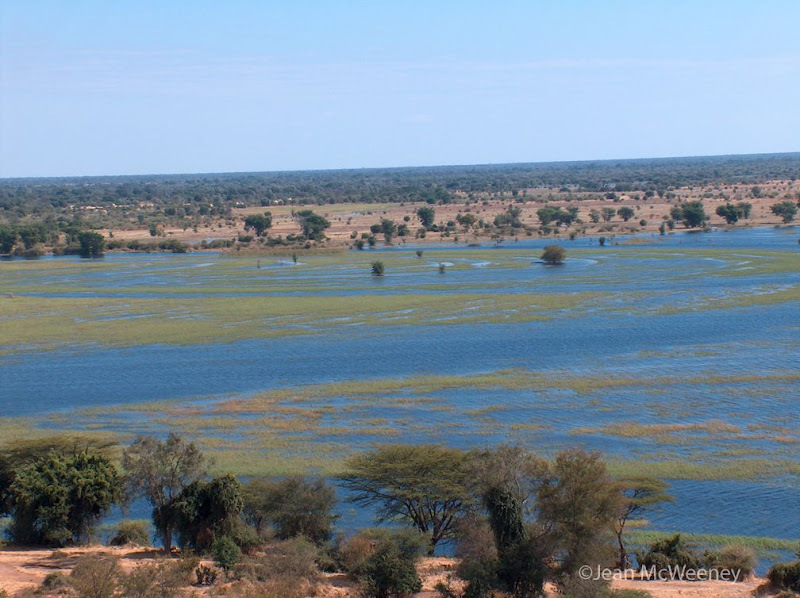 The park is located in northwest Botswana along the banks of the Chobe River. The area was declared a national park in 1967 and is home to a great diversity of animals. We stayed about 15 minutes outside the park at a lovely lodge called Muchenje. This was the first of three places we would stay in Botswana and when we arrived I had a raging cold. I mean really raging. Something I caught on the plane. But I'll be darned if it was going to stop me from seeing anything! 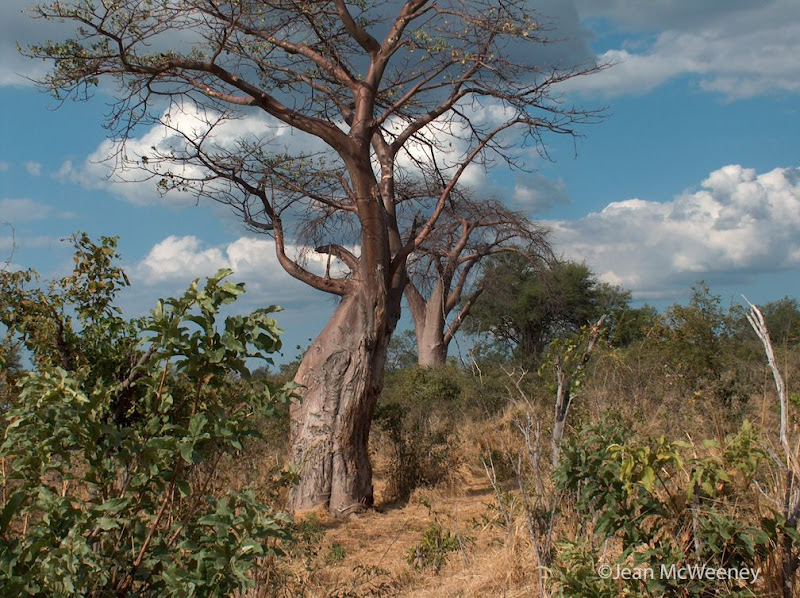 As soon as we entered the park I saw these fabulous baobab trees. 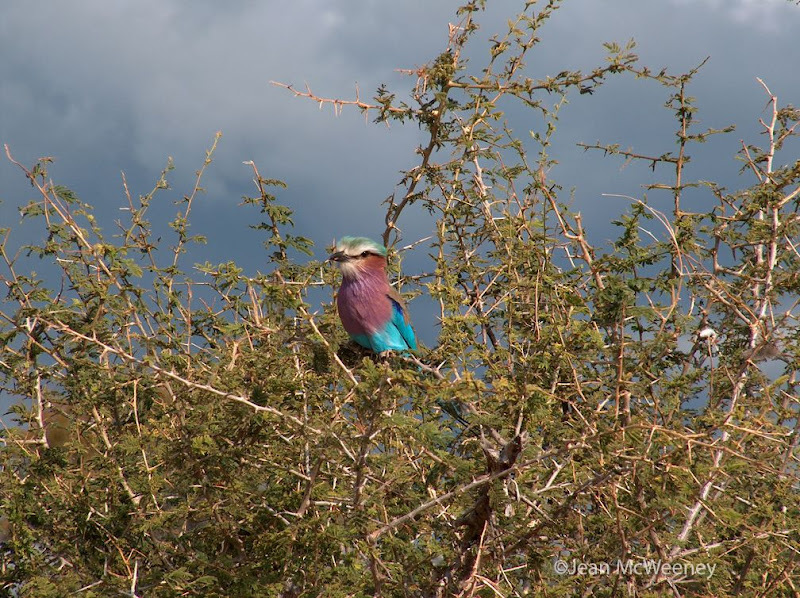 Then we immediately saw the national bird of Botswana, the Lilac Breasted Roller. The area in that part of the park is kind of scruffy, as you might be able to see from the two pictures above. There's a huge concentration of elephants in the park (Wikipedia says some 50,000 today, the highest elephant concentration in Africa). That explains many of the trees being in sad shape, what with the pressures the elephants put on the trees. Here's a young male about to make a mock charge at us (thank goodness it was mock). 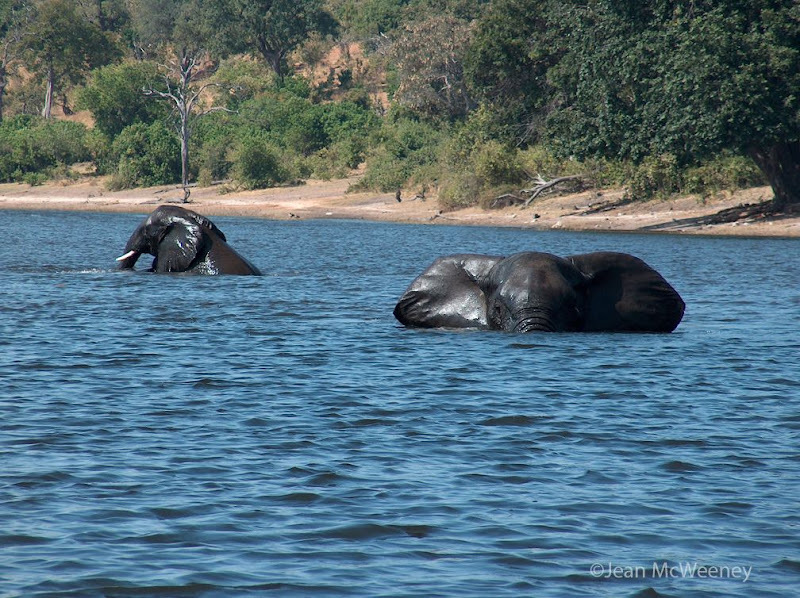 One day we took a boat trip on the Chobe River. This photo shows the river from our lodge. The far side of the river is the country of Namibia. You can see that we were there in winter (June) when there's still lots of water. As we motored up the river we saw tons of birds and other wildlife. 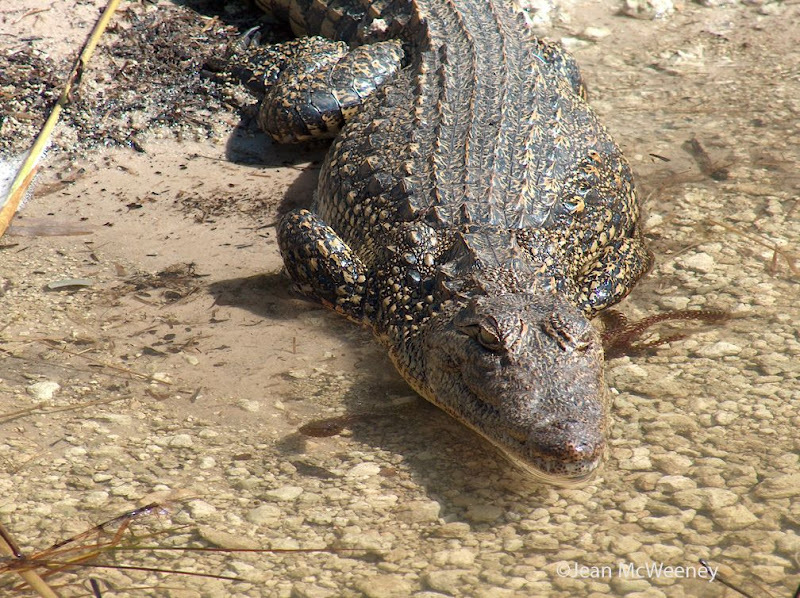 This crocodile was sunning himself on a sandbar. All of a sudden we came upon about 20 elephants, mostly young males, playing in and about the water. It was magical. They were wrestling and swimming, all very quietly. Seeing such large animals be so graceful and quiet was stunning. We sat there for a long time. It wasn't just elephants that were amazing. 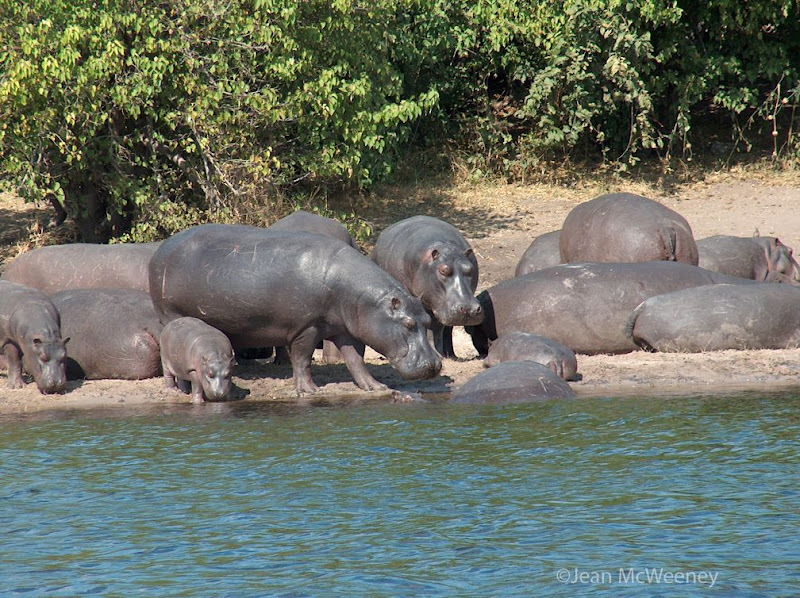 A huge number of hippo families were sunning themselves. I noticed our boat driver gave them a much wider berth than the elephants. I guess because hippos are supposed to be more dangerous in the water. 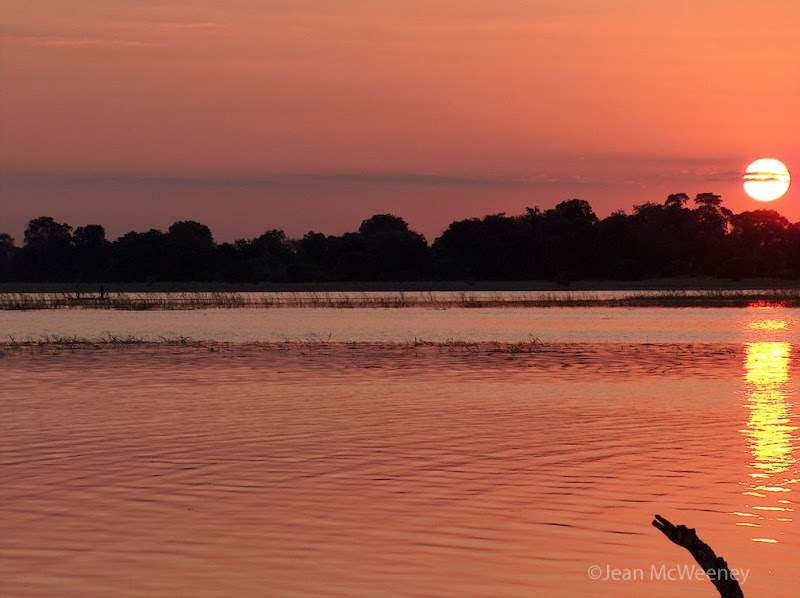 A lovely tradition on these photo safaris is to have a "sundowner". That's what happens at sundown out in the bush. Everyone has a drink, a little something to eat, and then sits down to admire the sunset. They were GORGEOUS there. I had just gotten my first digital camera and didn't know a lot about it but I couldn't help shooting right into the sun because of how beautiful it all was. If you look real closely in the top left corner of the photo below, you might be able to see two fishermen standing up in their boat. 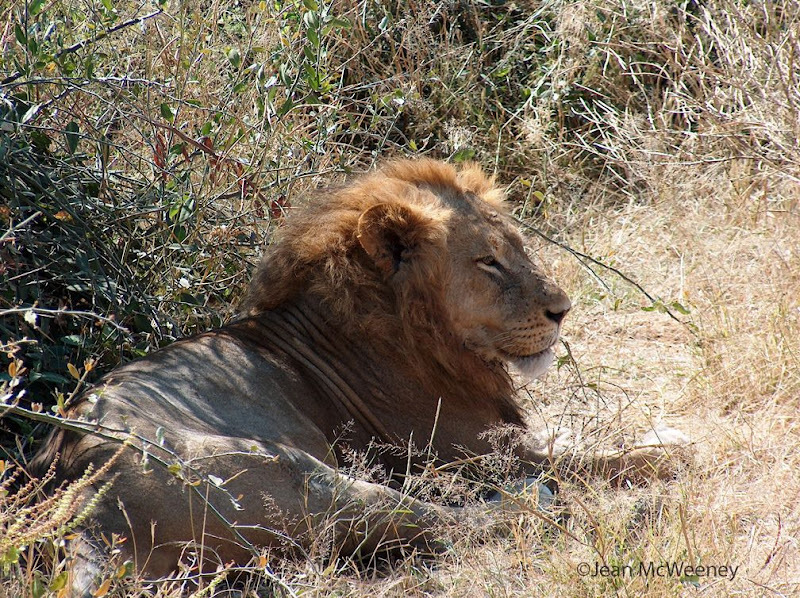 We were lucky to see a lion in Chobe National Park. Apparently at that time it was kind of rare. At subsequent camps we saw many of them. In case you're wondering about the strange names of my kitties, seen on the right of my blog, they come from our trip to Botswana. Chobe is named after where we saw our first lion (this one) and Duba is named after where we saw our last lions (Duba Plains on the Okavango Delta). 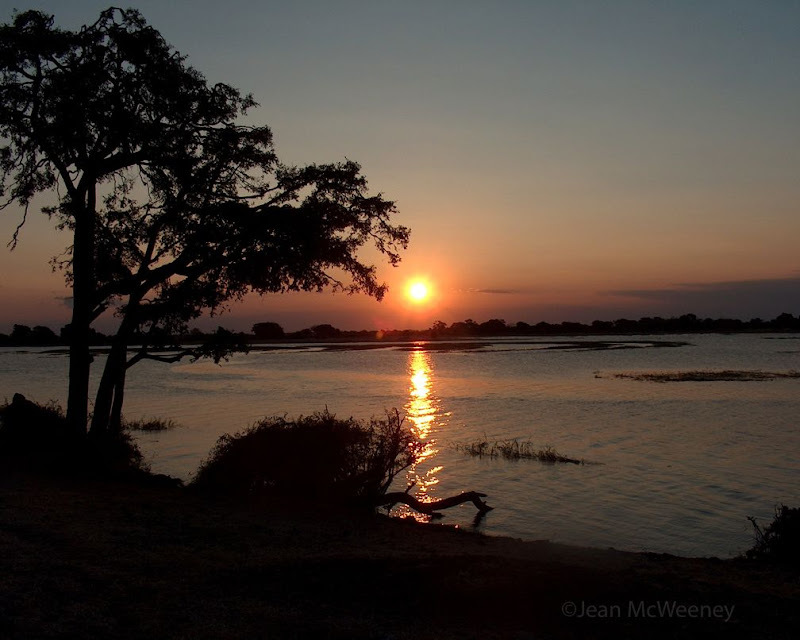 By our last sundowner in Chobe National Park I was recovering from my cold. And I was in the moment. I have never been so present in my life. It was as if I didn't have any other life to lead but that one right there, right then. 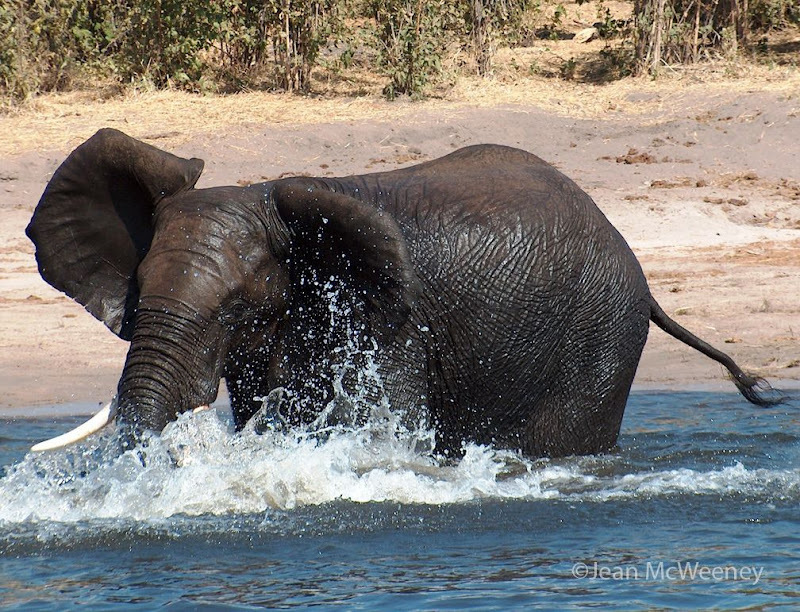 If you ever have the opportunity to go on a photo safari in Africa, I encourage you to do so. For me it was life changing, life enhancing. (I think that's what visiting national parks is all about, right?) The country of Botswana is much more than what I've shown here. It is full of kind and wise people. And a stunning array of wildlife which they care about. 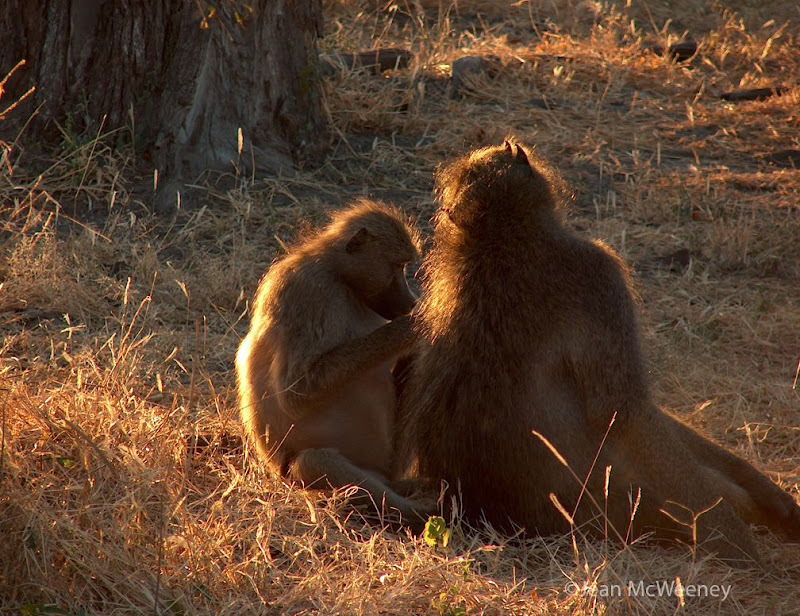 I leave you with a photo of why I went - a couple of grooming baboons at sunset, the one on the left looking pregnant. These are absolutely stunning photos. I especially liked the elephant splashing in the water, the group of hippos, and the first sunset. The bird is so unusual looking, with the purple and blue feathers. I definitely want to go on an African photo tour someday! Thanks for sharing your trip. What a beautiful post, Jean. Thanks for participating. I don't know if you were reading Digging a couple of years ago, but I went on an African safari in Tanzania and posted about it. I saw many of the same sights as you, but no swimming elephants. How magical to see them in the water like that. 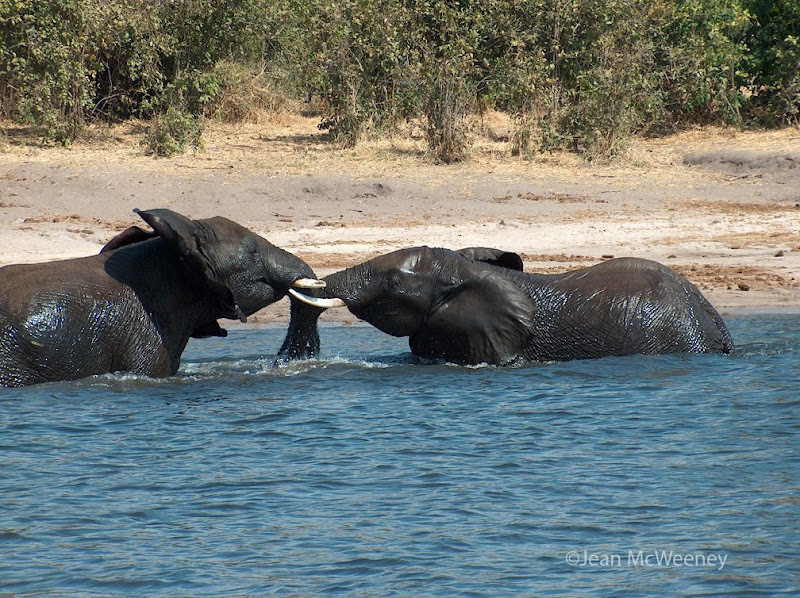 Thank you so much for taking us to Chobe National Park via your fantastic photos and commentary. The Lilac Breated Roller is the most beautiful bird I've ever seen. And......did you know at the time that the elephant's charge was mock? I know of someone around here who was attacked by an elephant in Africa. Very, very interesting post. Jean you are full of wonderful surprises! Now that was an amazing post! I don't think any other post can beat this one. You were very fortunate to have gone to Botswana. The former leader, Sir Sereste Khama sent his sons to Barbados for a visit many years ago. I was fortunate to have met them at a party and that was the first time I had ever heard of Botswana. You have woken up a sleeping tigress. Kathy (Gardening Angel)- thank you! Pam - I wasn't reading Digging a couple of years ago but at some point I noticed your Africa links and explored your trip photos. I think I even left a comment! 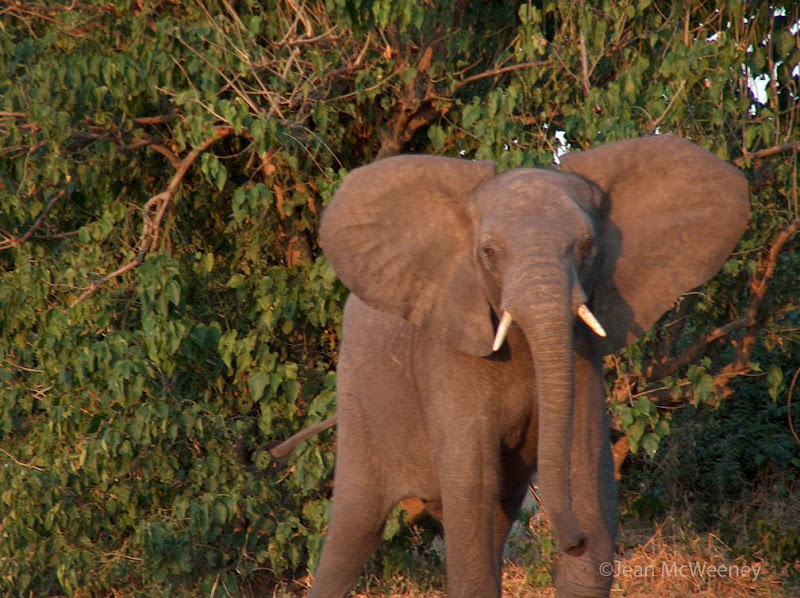 There's nothing like a photo safari in Africa, is there? Donna - our guide knew it was a mock attack but we didn't stick around much after that, for good reason probably! These safaris do present dangers (I have a story about our jeep catching fire and breaking down in front of a pride of lions!). Island Gal - the former leader of Botswana was wise enough to set aside money from diamond mining for education for every citizen, for as long as they want to go to school. Even through getting a PhD! What a great trip...and wonderful photos. 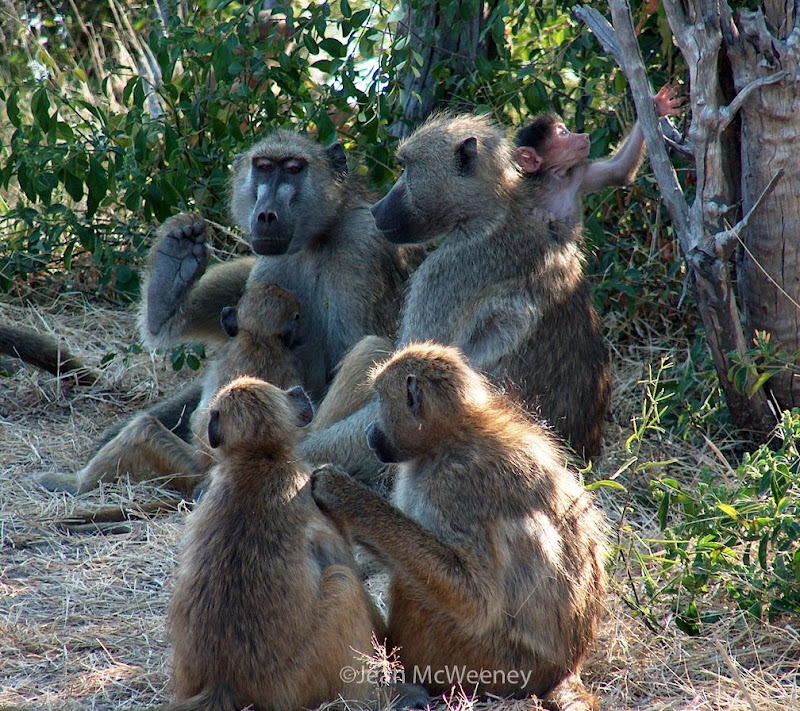 The last one, with the sunset light on the baboons is amazing. Thanks for sharing this with the rest of us. Wow. And these photos with your first digital camera?!! Thanks for sharing your wonderful adventure. Jean — Thanks, that was just an amazing treat to see this country and the wild life. I am in the same boat with all of my park pictures being slides. Guess this means it's time to get to a National Park with the digital camera. What a fantastic experience this must have been, Jean! Seeing all this wildlife in their natural setting has to be awe-inspiring. I know you went to see the baboons, but the photo of the lion is what captivates me. And your photo of the second sunset is just breathtaking--how can anyone think of anything else or being anywhere else with a scene like this in front of you? That's amazing! Now I really want to visit... Great photos, too. Thanks for sharing! What a very fun post and I can see why you left the comment on my blog about the Fur Balls plant ;). You've taken excellent photos and I felt like I was there. The photos and story were great to read, Jean. Thanks for giving us the chance to share the thrill as you had your longtime dream become reality. Loved the part with the slow and quiet elephants in the water.